Lucy Michelle: We definitely feel like Jay Z, and that is a first! There is something magical about playing in a museum; it’s an honor to share our art amongst all the other artists in the galleries. It’s almost as if we are a temporary musical installation, I don’t think it could get any better than that. KH: Is your song-writing influenced by visual art? LM: Yes, I’m a very visual person. Sometimes I’m surprised I can express myself through words since the way I see the world can be better described through images. KH: Are there particular visual artists that you look to for inspiration? LM: I wouldn’t say there is one visual artist I would go to in particular, but I do have some favorites. Recently, I was at the Met in NYC and I found myself overwhelmed with inspiration, seeing such famous works up close was astonishing: Picasso, Van Gogh, Mondrian, Klimt, and Monet. I was also impressed by a small section of snapshots from the early 20th century in their photography wing. Each one could stand alone but they all looked quite amazing together; the images could tell a story and it was a very neat glimpse back in time. Margarete Schütte-Lihotzky (Austrian, 1897-2000), Frankfurt Kitchen, 1926-1930, Kitchen cabinetry and stove. Gift of funds from Regis Foundation, 2004.195. KH: Do you have any favorite memories of being here at the museum? LM: I grew up going to the MIA, my mother is a painter and she would take me there when I was a little, quite often for her inspiration. As an adult now, I find it to be a very calming and nostalgic place. KH: If your music could play in any of our period rooms at the MIA, which would be the best fit? 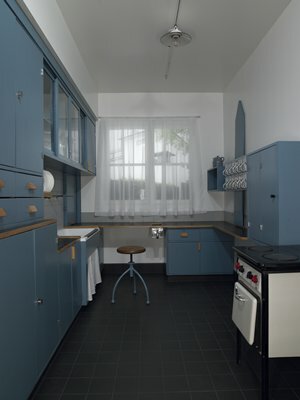 LM: I think the Frankfurt Kitchen, that has always been my favorite for reasons I cannot explain. And we are accustomed to small spaces. KH: Do you or any of your band mates have your own visual arts practice? LM: Yes, we definitely have a band full of artists. Ashley Boman (accordion and keys) does beautiful photography, on top of wood burning and drawing; Eamonn (cello) creates metal sculptures and drawings, as well as paints murals with his sister; Matt Latteral (guitar) has quite a good drawing hand, and I mainly do illustration in different mediums. KH: How does working in such an arts-heavy cultural environment like Minneapolis influence your work? LM: It forces us to work harder to create things we are proud to put out into the world. Join us on September 26 for an evening with Lucy Michelle and the Velvet Lapelles that will be a treat for both eyes and ears. Reserve your tickets now.